Laura Albanese, our MPP, has been busy of late. 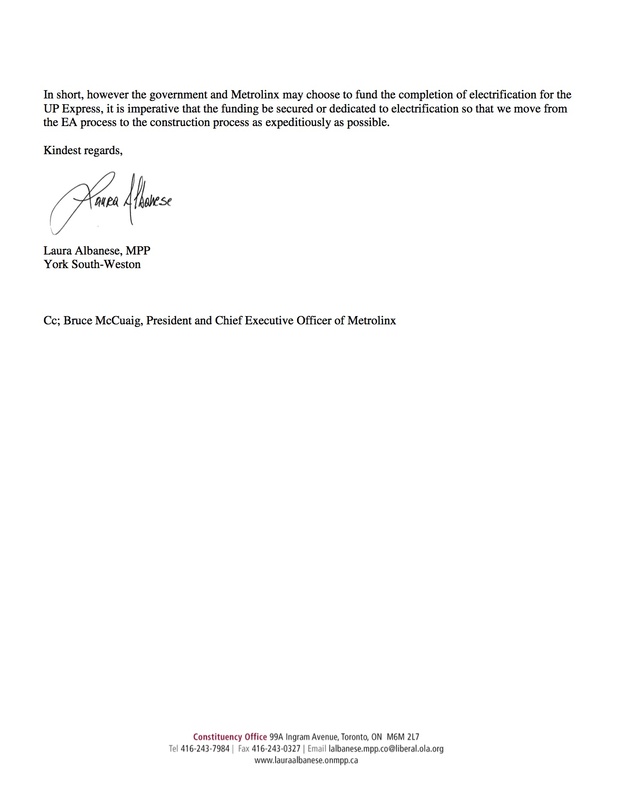 Last week she wrote a letter the Glen Murray, the Minister of Transportation, urging him to ensure electrification of the UP Express by 2017. The letter does not say that the electrification schedule is threatened, but no letter would be necessary if it weren’t. 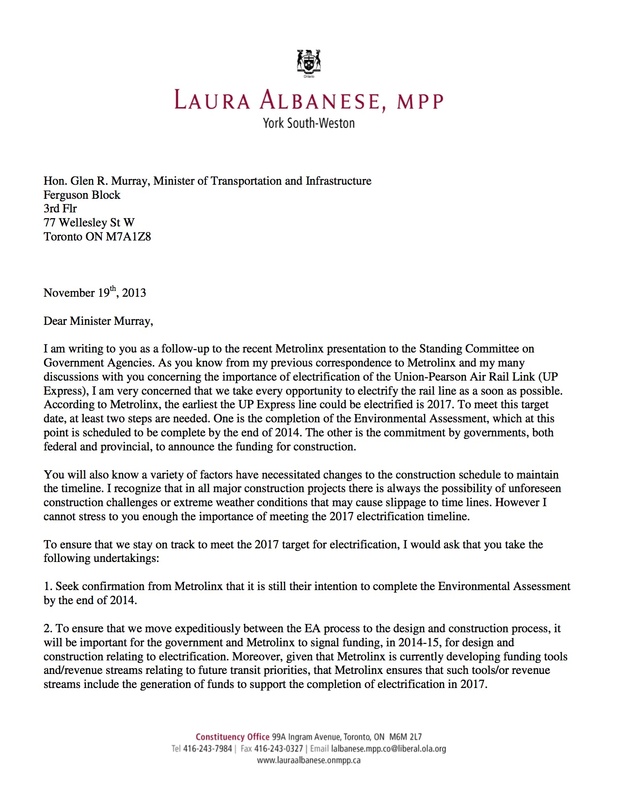 Albanese asked Minister Murray to get Metrolinx to confirm that they are still going to get the environmental assessment done by 2014 and to ensure that Metrolinx hustles between the assessment and construction. Albanese also spoke at length in the House about a resurrected bill to correct a conflict between old-age security and disability benefits. that permanent disability pensioners who were injured before 1990 have their workers’ compensation benefits reduced every year by the amount that their old age security benefit increases for inflation. In other words, in the view of the worker, you see this amount of money being stolen from you, if you will. It’s a small amount that the federal government will give you to keep up with the cost of living. Finally, she spoke about the closing Heinz plant in Leamington. She outlined the province’s response, including those of the ministries of Agriculture and Food; Training, Colleges, and Universities; and Economic Development. LOL….busy cause she wrote a letter to a minister that sits 10 feet away from her….what a joke, means nothing. HEINZ plant, too little too late…..lower electricity costs, may of saved the plant for another year, but in the end, low cost wages in far off countries will only satisfy hungry investors….stop buying HEINZ products. A letter? This is work? No, this is what citizens who aren’t handsomely paid for working on behalf of the community good do; politicians are supposed to act, interact, work with their party for the good of their constituents. Too little, too late? Not even that. Nothing for our benefit, nothing to alleviate the mess Metrolinx is making of our neighbourhood and the messy legacy go diesel fumes and noise pollution they will leave behind. Laura Albanese is stirring, I smell election time approaching. This woman, along with Francis Nunziata, has worked extremely hard at ignoring the Weston area. All one need do is walk alone the devastation which is Weston Road, to understand the depth of this neglect. When even pay day stores are closing down, you know an area is in trouble. Should read “along” not “alone”, darn self correction. When is Weston Web going to add an edit button? I am at the mercy of WordPress. Frances and Laura are always in Weston working with the community but too many people seem to have orange blindness to see it. Sullivan gives a speech and you applaud, yet no funding appears. Huzzah. Previous Previous post: Crime this month. Whoops.